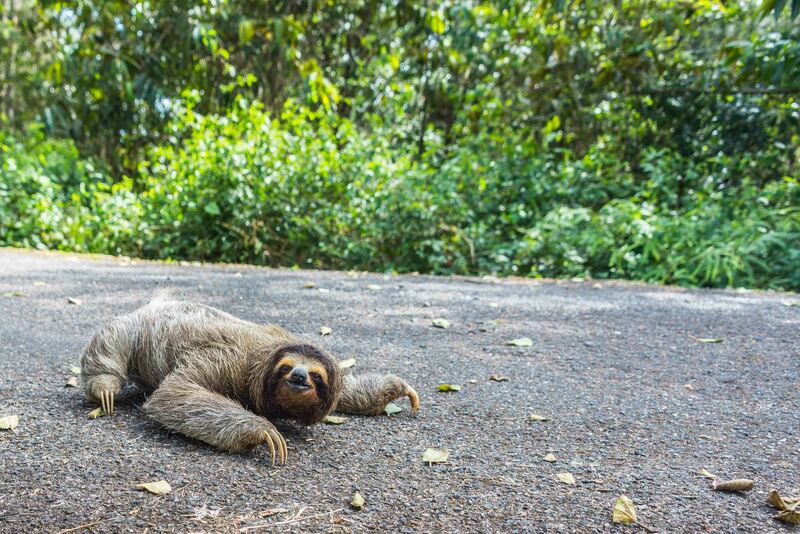 Today a sloth managed to stop us on the road to our site. They are so slow but managed a slick smile before getting across the road. Well, it is time to report on a little construction progress. You might find it of interest to see just how some of the things are done here, compared to home. It is a bit different! Here in Panama, everything for water is plastic. White plastic pipe with grey glue is for the cold water supply lines. Off white plastic pipe with yellow glue is for hot water supply lines. Drainage is also white plastic pipe but larger. Because we have decided to enclose the room below the main deck as a potential future guest suite, we are roughing in a washroom with shower and a kitchen. Rough in work is done in two stages. First, the pipes are laid under the floor before the concrete is poured. Those pipes are spliced off at places where water is required such as the shower, sink, etc. The main lines are cut and an individual line is placed that will be fed from the main line. The secondary line is placed into a broken out section of the block wall. The secondary part of the rough in takes place after the floor slab is poured so the concrete secures the pipes. At that time, the 90-degree fittings and stops are installed before the wall is skim coated with concrete, filling the holes and leaving a finished install. Electricity cable is similar although it is run through grey plastic conduit. Because the conduit is buried inside concrete walls, the conduit is placed but must be moulded to include gentle smooth curves so the cable can be pushed into the conduit later. This is done by filling the plastic conduit with sand then setting fire to an empty cement bag and heating the end of the conduit where a bend is desired. Eventually, the plastic sags into a gentle rounded curve. Allow the conduit to cool for a few minutes and pour out the sand and you end up with a piece of conduit that is properly shaped to fit the need. Later, wire is pushed through the conduit and properly terminated in a junction box in the wall. This house involved a lot of steel to meet the seismic requirements of the Panama building code. The footings for the house are buried two meters deep. Rebar must be cut to the proper length, configured, fit together and then wired together to hold it in place. Rebar must not be permitted to sit on the ground so it is raised from the bottom of the hole by placing a spacer under the rebar and above the dirt. At the bottom of the footing, a horizontal grille of rebar is placed. Next, the column is wired to the horizontal grill and forms are placed around the column. Last, the concrete is added. Simple? Yes, but lots of work! Here is a footing and column being put in place. When I look at the size and depth of the hole, I can appreciate why this kind of construction might be a good way to make someone disappear! Maybe Jimmy Hoffa will be found some day at the bottom of a footing for one of those tall buildings in Vegas. Making concrete here is also a bit different. We can’t get a cement mixer to come up the mountain. The roads won’t support it. Next, I thought we would get a cement mixer but you need a mixer that will mix four or more cubic meters at a time to keep up to a large slab pour. All we could find was one and two meter mixers to rent. Back to the old ways… mix it on the ground by hand! Today we poured a large four-inch thick concrete floor for the basement room that will be under the main balcony. I was amazed at the process. Four guys continually mixed cement, sand, gravel and water to make concrete. Two more guys ran that concrete from the mixing area to the pour site. The last two workers finished the concrete and ensured it was level. Using this process, they never stopped once they started the pour. Concrete flowed continuously. Who needs technology! I was just thinking about you guys today and wondering how the build was going. That is quite a bit of work for sure. How long is the entire build process supposed to take? Well, we were targeting the end of April but things may stretch a bit past that. We will close the project down at the end of April and re-start when we return in six or so months. Thanks for following. Thank-you. 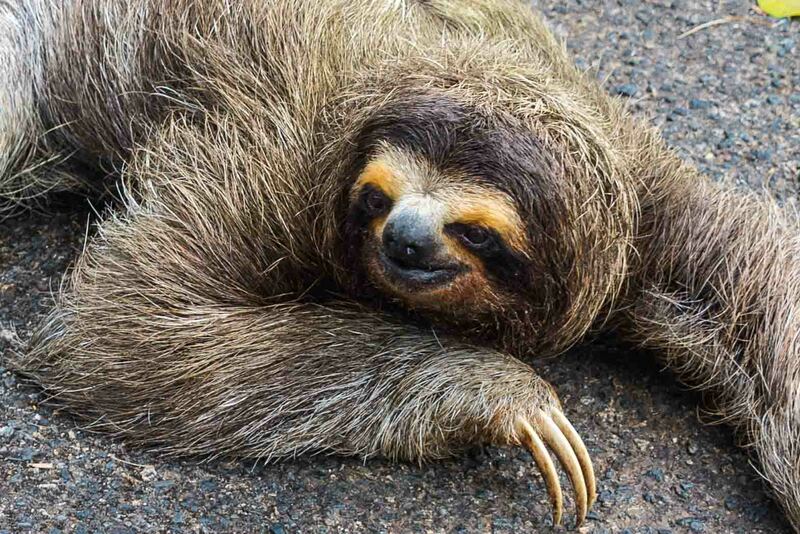 The sloth smiles at all the Gringos!